This new casual South Indian eatery located in Gemini Parsn Complex in Nungambakkam, allows customers to customise their curry cup with vegetarian/non-vegetarian options and bases to choose from. When my friend and I entered Madras Curry Cup, we were presented with a refreshing wet towel. This reminded me of my journeys in Jet Airways flights. The moment the flight took off, the air hostesses would give us a hot/cold towel to wash our face and hands. We were then asked to customize our Curry Cup with the available bases like Mini Idly, Idiyappam, White Rice, Brown Rice, Kuli Panniyaram, Kuduraivali, etc, add some of their signature curries and then top it off with veggies/ proteins. I chose Kuli Panniyaram (a.k.a Kuzhi paniyaram or Paddu or Gunta Ponganalu or is an Indian dish made by steaming batter using a mould. The batter is made of black lentils and rice and is similar in composition to the batter used to make idli and dosa), Vada Curry, Vendakkai (Ladies Finger) Thayir (Curd) Pachidi, and Chickpea Sundal. Along with our curry cup, we were also given a cup of Rasam. I so hate drinking Rasam off a cup but for the first time I loved it. The Rasam was as thick as soup. The Coconut Burfi reminded of my school days when my grandmother prepared it once in a while and we cousins gorged on them. Badam Milk was thick and tasty and had several crushed almonds inside the bottle. I drank the Badam Milk while my friend tasted both. Sastharam Ravendran is a 2nd Generation Serial Entrepreneur. He is the Chief of Operations of the Sarash Group, a 150 Crore Business based out of Chennai with global footprints foraying into Asian Markets like Japan, China, & Taiwan, other countries like Russia and UAE and European markets like Germany & Switzerland. Sastharam Ravendran is an Electronics and Communication Engineer who has a Masters in Business Adminsitration - Executive Management from New York, USA. Fondly called as the "Voice of the Chennai Toastmasters", Sastharam Ravendran is also a passionate Public Speaker. For the uninitiated, Madras Curry Cup has already left an indelible mark in the online food market with their impeccable quality and inventive packaging systems that keeps the food piping hot till the point of consumption. 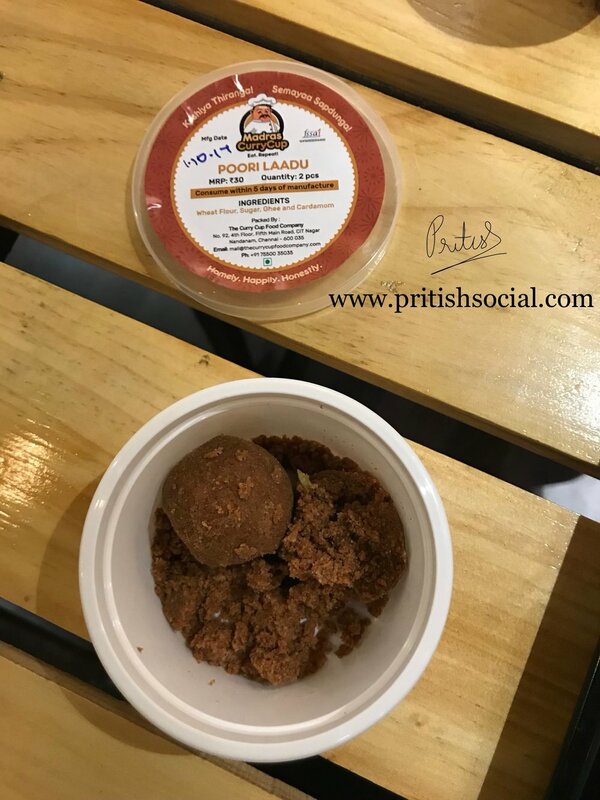 “Following the popular demand for our takeaway where the South-Indian cuisine can be consumed on the move without any hassles, and after having kiosks in supermarkets across the city, we’ve finally launched here..” says a beaming Sastha. Madras Curry Cup outlet is in the heart of the city with parking 2 and 4 wheelers. They also undertake orders for parties and outdoor catering services. Home delivery can be availed for free in locations within 5km radius. Celebrating the inauguration of their model restaurant, they’re offering Customizable Lunch and Dinner Curry Cups at amazing prices till 30th November 2017. For details, call: +91 755 003 5035. Follow Madras Curry Cup on Facebook for more updates.